... and to all a good carp! 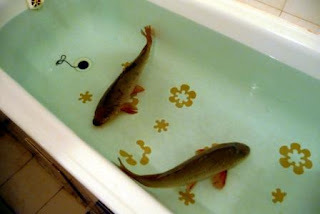 These lovely fish were swimming in our friends' tub as of yesterday. As of a few minutes ago, a lovely portion of them (along with traditional Slovak potato salad) is swimming in my stomach. Yay for friends! And carp! Another traditional Slovak Christmas Eve dish we made and enjoyed this year. It is a sauerkraut soup with klobasa (sausage) pieces of pork or beef, dried mushrooms, and pieces of prune and apple. It is so, so good. 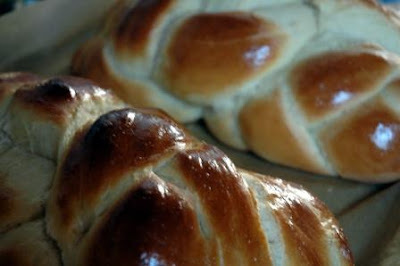 Also good, if not traditional Slovak Christmas food: homemade challah bread. We'll have more stories and pictures up soon. My parents are here! So Merry Christmas and Happy New Year from the Edison-Swift-Albrights in Bratislava, Slovakia. When I would leave for a week or two of camp, my mom knew all was well when she stopped getting mail from me. If she didn't hear from me, life was too good, busy and exciting for me to sit down, get introspective, and compose something meaningful like: "The girls in my cabin stay up all night making fart jokes. They are so imature (sic)." When the letters stopped arriving, she could rest easy knowing I'd found my place and maybe lightened up enough to make a fart joke or two. This is all well and good, but that "don't write when all's well" impulse continued when I went to college (Sample email from my dad: "Just making sure you are alive. Sign on to IM sometime!") and right up to today, making me a terrible blogger, email correspondent, long-distance buddy, journal-keeper, daughter, etc. So, uh, all's well! I have a bit of a cold, but I'm giving my immune system regular pep talks. I've been crazy busy but in a good way: finding my place, lightening up a bit, making fart jokes here and there (not really, but it's on my to-do list.) I've given a bunch of sermons which we haven't gotten around to posting yet--we'll keep you posted on the posting of those. These days I am unreasonably overjoyed by winter weather, cautiously optimistic about completing internship paperwork, and a little weepy with anticipation for my parents' arrival on the 24th. Monday: doctor’s appointment (I set this up, found the place and went to it by myself—an achievement), figuring out buses to get to school from the appointment, getting to school just in time (but without my keys! Doh! ), teaching four classes on the topic of natural evil (how is God involved in hurricanes, famines, etc.? ), meeting with my supervisor to go over what’s happening this week, begin plugging Sunday’s service into our bulletin template. Tuesday: give a testimony of my life with Jesus to the weekly women’s Bible study I attend, more planning (for Sunday and Wednesday evening) and bulletin. Wednesday: lead chapel worship at school, teach a class, help lead Thanksgiving Eve service at 7 pm, work on skit for stewardship Sunday. Thursday: teach three classes, clean our house in preparation for guests for our weekend Thanksgiving celebration, shop for what we need to cook our offerings for the feast, go out for pizza with American and Slovak colleagues from school to celebrate actual Thanksgiving day. 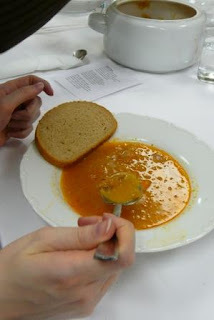 Friday: cleaning, serious Thanksgiving cooking by my husband, getting bulletin ready to print, going to a goulash party with Slovak and American friends and guests who have begun to arrive and eating delicious venison goulash. Saturday: Thanksgiving! Amazing feast, about 35 people gathered, skits, games, massive communal clean up and then off to the Christmas Market in old town Bratislava … and then back to the warm apartments for dramatic readings from Shakespeare and other fun times with our colleagues and guests. Somewhere in there, I print and copy the bulletins and they get folded by our friends (sweet!). Was that a normal week? No way! But there really hasn't been a normal week. This week at church we have a baptism, recognition of first communicants and the Sunday School Christmas Program. And tonight is our first night going with our friends to the symphony! Yesterday all my regular classes we cancelled and I taught two classes of first years. At some point, we will put up and decorate our wee Christmas tree. Life is good, busy and exciting indeed.